Dorothee Kern is Professor of Biochemistry at Brandeis University and an Investigator of the Howard Hughes Medical Institute since 2005. She received her PhD at the Martin Luther University in Halle, Germany and then carried out her postdoctoral studies at UC Berkeley. She joined the faculty at Brandeis University in 1998. Her research group studies the dynamical nature of proteins with the goal to reveal the interplay between structure, dynamics and function. She has been a major contributor in the experimental characterization of protein dynamics during enzyme catalysis and signaling. She pursues a new vision of protein dynamics and allosteric networks at the heart of drug discovery, and is a founder of Relay Therapeutics with the mission of exploiting protein dynamics for expanding therapeutics. Recently Dr. Kern is reconstructing the evolution of proteins over billions of years to discover primpiples of evolution of energy landscapes for improved organismal fitness. Dr. Kern got elected to the German National Academy of Science Leopoldina, is the recipient of the Pfizer Award in Enzyme Chemistry from the American Chemical Society, the National Lecturer of the Biophysical Society, the Dayhoff Award from the Biophysical Society, the Young Investigator Award of the International Association for Protein Structure Analysis and Proteomics and the Strage Award for Aspiring Young Science Faculty. 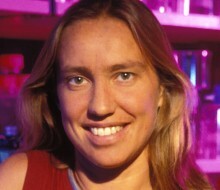 Before her professional scientific carrier, she was captain of the German National Basketball team for many years and won an MVP award.